Second Vehicle Occupant Located from Fatal Accident, BLANCHARD, January 7, 2016 - A second occupant of the fatal crash that claimed the life of a 44 year old Conroe woman (Wendy Banks), has been located. 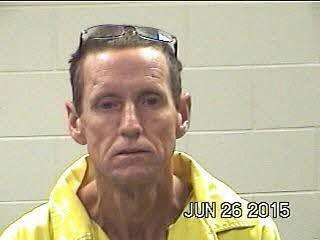 Edward Allen Dobson, 53, of Livingston, was located at his residence in Blanchard. Dobson was found later in the night after the accident off FM-2457 when a white 1995 Chevy 1500 pickup struck a culvert and turned over in a drainage ditch. Dobson's wallet was found at the scene. A short time later, Deputies from the Polk County Sheriff's Office found Dobson at his residence in Blanchard. Dobson had sustained serious injuries from the accident and was transported by ambulance to CHI Livingston Memorial Hospital. He was later flown to Houston. An investigation into the accident has not yet been able to determine which of the two (Dobson or Banks) was driving the vehicle. Dobson remains hospitalized in serious condition. Fatal Accident Under Investigation by DPS, BLANCHARD, January 7, 2016 - At approximately 12:15 am on January 7, 2016, a white 1995 Chevy 1500 pickup was west-bound on FM-2457. The pickup left the pavement to the left and struck a culvert and came to rest upside down in a drainage area next to Lake Livingston RV Park. A passer by drove upon the accident and notified the Polk County Sheriff's Office. Americare Ambulance Service was dispatched to the scene along with the Livingston Volunteer Fire Department, and Deputys were dispatched, including Sergeant David Ramsey, Teddy Sims, and David Sotasaney with the Polk County Sheriff's Office and Trooper Donny Akers with the Texas Highway Patrol. Emergency personnel pulled 44 year old Wendy Banks, of Conroe from the pickup. Banks was loaded into an ambulance as EMS personnel immediately began to administer CPR. Banks was rushed to CHI Livingston Memorial Hospital where she was pronounced dead. Justice of the Peace, Jamie Jones performed an inquest. At time of press, it is not clear whether or not Banks was driving the pickup. Evidence at the scene suggests that another person may have been driving and fled the scene. The accident remains under investigation by the Texas Department of Public Safety. The pickup was recovered by Ken's Towing and will be stored at Harrison Body Shop in Livingston. Editor's Note: The lateness with which this story was reported is due to the proper protocol of not reporting the information (name of deceased) until next of kin have been notified. Firemen from Livingston arrived to find the pickup upside down in a drainage area. The pickup struck a culvert and came to rest upside down. Trooper Donny Akers (pictured) is the primary accident investigator. The pickup was turned upright and recovered by Ken's Towing. The pickup will be stored at Harrison Body Shop in Livingston.